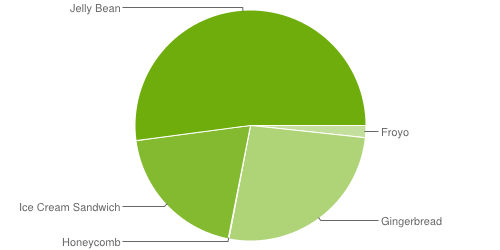 Still a crapload at Gingerbread (even more than ICS... but then again, most that got ICS got JB, whereas most that got Gingerbread probably didn't make the ICS cutoff). Honeycomb is jus thanging in there by a thread (I guess to cut it out would leave a bit of a gap, and the OCD in me would just cringe). And if you're keeping tally, that's 72% running on 4+, that's almost 3 out of 4 devices... If I were a developer, I know what API I'd be shooting for.